This first week of May mainly consisted of wrapping up April and kicking off May, which is why only one review went up, but it was a good one! 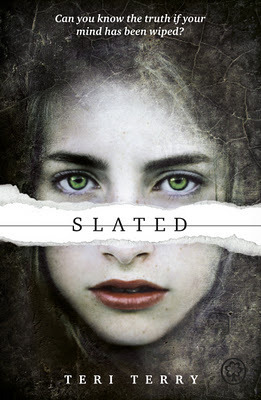 I reviewed Slated by Teri Terry, which is a great dystopian debut for 2012. It's the first in a series and I'm already impatiently waiting for the second book.. Why does Fracture need to come out in May 2013? Aaahh the agony! And since it's May now, I'm very excited to be co-hosting Bella & Daph's Epic Review Month! During the entire month we focus on reading review books, but anyone can join! As long as you have books to read, you can participate! My goal is to lower my TBR some more again, because even though I managed to read quite a few review books so far this year (21), the pile is still too big.. Anyhoo, this month kicked off with a kickoff post on the 1st of May, where you can find all the deets. On Friday, the first wrap up went live - including a giveaway to B&DERM participants! While I was browsing the worldwide interwebz, I came across Zoë Marriott's 'All About Writing'-page (yay, she finally put it up! ), which I would definitely check out if you're into writing! I love her writing posts, she has some great advice.. I would definitely check out her posts on plotting because they really helped me out with my writing. Meanwhile another one of my favorite writing-advice-writing-authors, Jodi Meadows, did a post on writing a perfect first draft. Besides that, I have to admit I haven't checked any book blogs because of the Insurgent review overload. I haven't even gotten my copy in, so I'm trying to avoid book blogs for now since everyone seems to be reviewing Insurgent!